What did it mean, this strange verse? 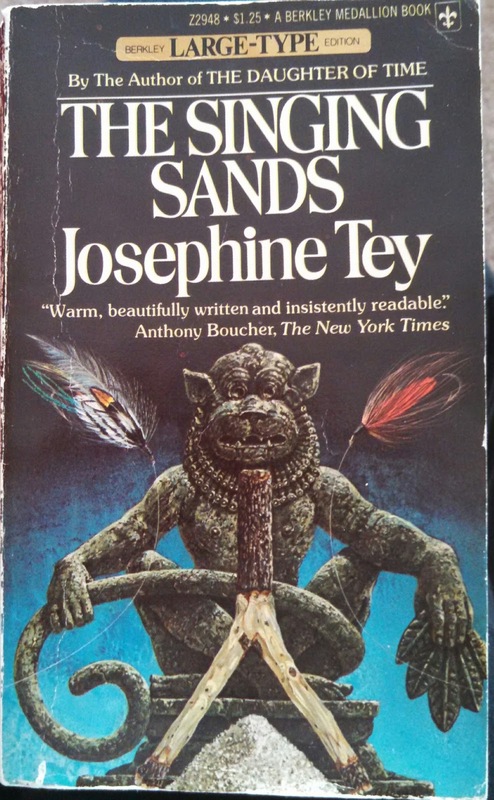 Where are the talking beasts, the singing sands? What mad Paradise was this? Inspector Alan Grant of Scotland Yard was on sick leave, but he was so fascinated by the poem and the reckless-looking youth who had scribbled it – a youth he’d found, by accident, quite dead in a train bound for the Scottish Highlands – that he couldn’t relax or enjoy the heather… until he had uncovered all the sinister details in one of the cleverest murders in criminal history. This is the sixth in the Inspector Alan Grant Series by Ms. Tey. It looks like I’ve read all but one now, To Love and Be Wise. I did not read this series in order, just as I found the books. Each of the Alan Grant books were good, but I have to say that Alan Grant didn’t make me want to run out and get the whole series. This finally one starts out with Alan going to his cousin Laura’s in the Highlands to fish and relax. He has been suffering from severe claustrophobia. Being in a car or a train or plane were excruciating for him. Having managed to survive the train ride north from London, as the train was disembarking he came upon a train porter trying to wake a young man. Problem was the young man was not sleeping but dead. The police ruled it a suicide and Alan went on his merry way. Inadvertently he had picked up the young man’s copy of the newspaper when helping with the body. He discovers this verse written in the margin and is haunted by it and his impressions of the young man. Eventually he gives in to his sub conscious that keeps brining him back to this death and he embarks on a search for the meaning of the verses and the truth behind the death. This was a slow read. I could have easily put it down and went on to something else. But I liked Alan’s cousin Laura and her wee boy Pat. The setting and the fishing were restful as well. So I trudged on. The last 1/4 of the book got busy and interesting and I’m glad I finished it. A very satisfying read after all! How about you, have you read this and did you find it slow? This one counts for Read Scotland 2016 and My Reader’s Block Scavenger Hunt Gold – Statue. Robert Blair is an attorney in a long running family law practice. He is in his forties, unmarried, lives in the family home with his ‘aunt’ Lin who is really an older cousin. She is much like a mother to him. He has a comfortable, routine, safe life. Until he answers the phone late one afternoon. His life is turned upside down. Just five minutes more and he would have been gone for the day and life would have been much the same. Marion Sharpe and her elderly mother need legal help. A young girl has accused them of picking her up on the street and holding her against her will and beating her. She has the bruises to prove it. Marion calls Robert and asks him to hurry out and be present when the police and Scotland Yard’s Alan Grant, are present with the girl to confront her and her mother with these charges. This is not Roberts speciality in law by any means. He is use to elderly ladies changing their wills ever time the wind blows and handling estates. He tries very hard to turn Marion away, but in the end she convinces him to just come for this one meeting to make sure they are not railroaded. He finally agrees and runs out to the Franchise, their old crumbling estate, and his life is forever changed. Convinced of their innocence even though the girls story is airtight and very convincing, he sets out to do all he can to get to the truth and vindicate the Sharpes. I’ve noticed a few readers didn’t particularly like this Tey. There is no murder and Alan Grant has a very small part in it. But I enjoyed it. It was a good puzzle with characters I liked and solid descriptions. I could visualize the Franchise and the surrounding towns etc. I enjoyed watching Robert’s life loosen up and expand. I had an old 1965 Dell paperback copy to read. Small, 50 cents new and yellow pages. I loved the feel of it in my hands! Just added to the enjoyment of reading it. Sadly a couple of the first pages are coming out, but I still love it. If you get a chance to read it don’t let anyone put you off. It’s a good read! Good characterization, solid puzzle and nice climatic ending. Only my second Alan Grant book and not really one of my favorites but enjoyable all the same. Originally published in 1936, this the second of eight mysteries written by Ms. Tey. Fun read! Full of charming characters, gentle humor and a well plotted mystery. I really the character of Inspector Alan Grant. Not afraid to get his information a little outside of the ‘rules’, but full of caring and sympathy. I don’t want to give away too much about the book and spoil your fun of reading it for yourself… Tisdale is a fun character on the run from Inspector Grant and his men. He’s their key suspect. The police chief’s daughter, Erica, is sure he is innocent and goes out on the limb to help him. She brings him food until he turns up missing and then she is on the hunt for the item the police are looking for, as she’s sure it will clear him. Erica is a great character and Grant has a soft spot for her. Does she find the item? Does it clear Tisdale? Do they ever find Tisdale? And does romance bud between the two? There are lots of interesting suspects, fellow actors who hated working with Christine, a husband who is a Lord, a male friend who shows up the morning they find her body and every says they are lovers, an astrologer who predicted her death and a no good brother out for her money. It could be any of them. I certainly didn’t guess the right person! See if you can! ‘A bell clanged. Brazen, insistent, maddening. Through the quiet corridors came the din of it, making hideous the peace of the morning. From each of the yawning windows of the little quadrangle the noise poured out on to the still, sunlit garden where the grass was grey yet with dew. Little Miss Pym stirred, opened one doubtful grey eye, and reached blindly for her watch. There was no watch. She opened the other eye. There seemed to be no bedside table either. No, of course not; now she remembered. There was no bedside table; as she had found last night. Her watch had had of necessity to be put under her pillow. She fumbled for it. Good heavens, what a row that bell was making! Obscene. There seemed to be no watch under the pillow. But it must be there! She lifted the pillow bodily, revealing only one small sheer-linen handkerchief in a saucy pattern of blue and white. She dropped the pillow and peered down between the bed and the wall. Yes, there was something that looked like a watch. By lying flat on her front and inserting an arm she could just reach it. Carefully she brought it up, lightly caught between the tips of first and second fingers. If she dropped it now she would have to get out of bed and crawl under for it. She turned on her back with a sigh of relief, holding the watch triumphantly above her.